Fantasy Football vs. Investing - Are They Similar? Fantasy Football vs. Investing – Are They Similar? It's that time again. Football is back!!!!!! Now, I'm fully aware that some of you don't give a crap about football – ESPECIALLY fantasy football. Maybe it's just because I grew up in Texas, but it's a big enough deal that my family watches it every Sunday and I'm in two leagues. If you have absolutely no interest in hearing how fantasy and investing are similar, I've got your back. I pulled a very special post out that I wrote a LONG time ago. One of my favorites. How I Paid Cash for My $25,000 Wedding! Ok – if you're still with me, let's talk fantasy! Believe it or not, the only “real” writing experience I had before I started M$M was WAY back when I was the commissioner for my job's fantasy league. Every week after the games were done on Monday night, I would write league letters that recapped all of the match ups. I guess they were pretty funny/creative, because everyone seemed to love them! It was the first time I realized I had a unique writing voice. I directly contribute the creation of this site to those commissioner letters. So weird haha. My good friend, who I recently interviewed for my “Multi-Millionaire” series, was asking me about fantasy football. He has a few million invested in the stock market, so he was basically wondering why Millennials (or anyone for that matter) would waste so much time on a game instead of learning how to invest. There is a ton of content out there about how important it is to get started with investing when you're young. I won't bore you with numbers again, but seriously. Millennials have time as an asset that we'll never get back. However, investing has a really powerful negative stigma attached to it for young people. It's hard. It's only for rich people. Our parents got crushed back in 2008. It's too risky. The reality is that having a basic understanding of the markets is not all that complicated compared to other things that we are [email protected]$$ at. Specifically – learning how to use Snapchat and mastering fantasy football. Those ARE hard. hg789 <- My cat just jumped on my laptop and wrote that. I'm leaving it. ESPN, Yahoo, NFL, CBS = Schwab, Fidelity, Motif, Vangaurd, Betterment, etc. The platform that your league chooses for fantasy is important. All of them have different intricacies, and you need to learn them if you want to stand a chance at managing your team well. They also have their own unique research tools and player rating systems. Sounds a lot like brokerages and their stock rating tools to me…. You're in total control of your team. You pick the players, change the lineup as you see fit, and lead your team to victory. The same goes for the companies you own. The dues for my league this year were $40. If I invested $40 per month and received a 7% return on my investments over the next 30 years, it would be $45,645.67. If you need to find some extra cash every month, you can take a look at some ways to save money on food every month here (you're welcome). All of the major fantasy football platforms force you to have a well balanced mix of players on your team. Running backs, wide receivers, quarterbacks, etc. Some of the robo-investing platforms like Motif or Betterment help you diversify with all sorts of stocks, bonds, and ETF's, but the same can be done on your own with the large brokerages! Now admittedly, I didn't do quite as much research for my drafts this year as I usually would. I DO know several people that I've played with that do crazy research and bring their cheat-sheets to the draft with them. If you can spend that much time looking up football players, you could probably research a stock and it's Price to Earning and Debt to Income ratios. Just saying. This one is pretty obvious right? If a player is underperforming or you think you can get a ton of value by making a trade, you can do this really easily through your fantasy football platform. It's ALSO really easy on stock trading platforms…but be careful. Transaction fees will eat your portfolio returns alive if you aren't careful. As a side note – Spencer Jakab from the Wall Street Journal sent me his book Heads I Win, Tails I Win a few months ago to review (Isn't that crazy? Journalists actually send me their books). I'll do a full review soon, but the premise is that the best investors generally leave their portfolio alone much more than weaker investors. Something to think about! See what I mean about fantasy football? Now obviously, this is super super simplified. But I guarantee if you can figure out how to research players and draft a fantasy team, you can research stocks and make your first trade. What other similarities did I miss? Add yours below! Not a big football fan, I will watch football if it means getting good chicken wings though. This article makes a lot of sense and I will be sharing with those of whom “don’t have time to invest” but know every player traded, injured, etc. I think to many people just say they don’t have time but spend it doing things that could be better used. Not saying football is wrong, I’m saying that if you can’t get other things done but you have a ton of time to read everything about football, then you really do have time. Haha thanks for sharing! That’s really the point – if you have time to sit down and research fantasy, you also have time sit down and learn more about investing. I know nothing about football so that one was a shot in the dark haha. I fully agree with your friend regarding the way time is spent. Many of my friends will spend hours doing fantasy football (nothing wrong with it) and no time investing in themselves/future. It comes down to what do they want in life I suppose and right now priorities are different. Haha yeah that’s a good one! I think the average Joe like me spends less than 10 minutes a week looking at my lineups. But it really is like the Pokemon thing I talked about weeks ago. If you have time to sit around and watch football all weekend – you probably could use that time a little more wisely if you aren’t happy with where you are! I’ve actually thought about this concept a lot, there really are a lot of similarities. I really enjoy fantasy football and probably spend way too much time on it, but it’s great bonding with friends. One of my leagues has had the same 10 guys for 6 or 7 years, and a few of them I only stay in touch with because of being in the league together, it’s pretty cool. Haha that’s so funny – the team on the right won and the one on the left lost by a few points this week. I started one with my sister and some other friends – it’s a lot of fun and a good excuse to hang out with family on Sunday. That’s a good one!!! It’s too early for me to tell where I’ll end up. 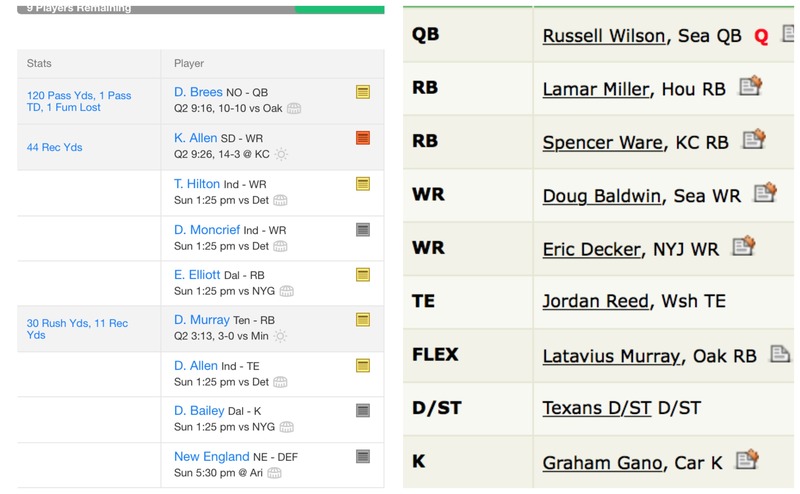 I think my ESPN league will be a lot better than my Yahoo…we’ll see! A friend just barely walked me through how fantasy football works. I’m not in it because I don’t want to put up money for something that I know nothing about but an interest concept. I’m following my “Don’t understand it? Don’t invest in it” rule for fantasy football! Haha that’s probably a safe strategy! Our league dues are pretty cheap, but I’ve seen some ridiculous ones from some of the “serious” players out there. Enjoyed this a lot! As both a serious fantasy football player (I’m in 7 leagues) and a serious investor, I’ve often thought about the similarities. Poker is another pursuit that’s similar. One more similarity; to be a successful fantasy football player or investor it’s important to think long term and not chase past results! I.e. you don’t trade Odell Beckham for Willie Snead after one week! Nor do you contiually try to find the next hot stock when investing! How’s the team on the left doing? Must be struggling at WR after losing Moncrief and K. Allen. I’m 1 and 2 in all of my seven leagues 🙁 not a great start! I’ve linked a post I’ve written called “Investing for non-millionaires” it’s all about how regular people can get started investing. Holy crap 7 leagues!!! That’s nuts haha. The team on the left and right are sucking. Womp womp. It’s a long season though….